58+1 Indices on the body (2012/2013). The project is a collaboration between the artistic collective AMAE and the artist Pier Giorgio De Pinto. The topics come from the treaty 58 indices sur le corps (Editor’s note 58 indices on the body), written in 2006 by Jean-Luc Nancy and related to his book Corpus. The project combines performances, videos, interactive installations and collaborations with many artists. THE BODY IN 58 HIGH TECHNOLOGY PERFORMANCES. 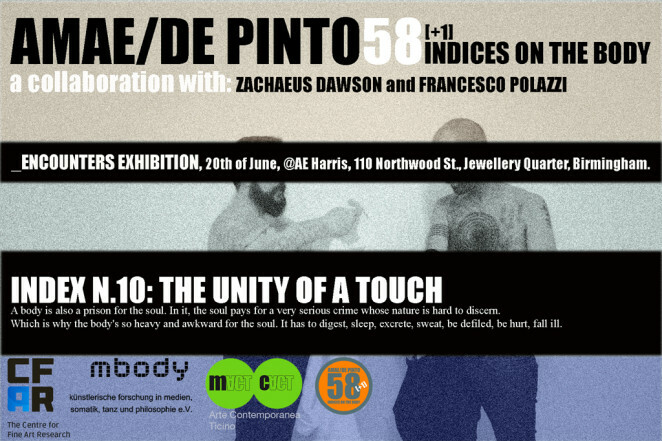 The artistic collective Amae and the artist Pier Giorgio De Pinto present an impressive project, whose topics come from the treaty 58 indices sur le corps (Editor’s note 58 indices on the body), written in 2006 by Jean Luc Nancy and related to his book Corpus. 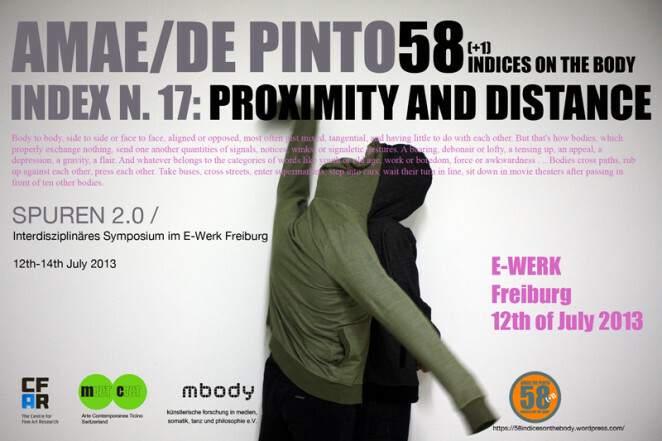 The project entitled 58 (+1) INDICES ON THE BODY – Emulation as mimicry of transit within performance art. Empathy and conflict between identity and otherness will be an excursus on the contemporary body and its boundaries/potentials in a perspective that flattens the hierarchy between artist and audience through the process of emulation. This would enable the audience to unleash conflicts, which push towards a critical approach instead of a simple behavioural mimicry. 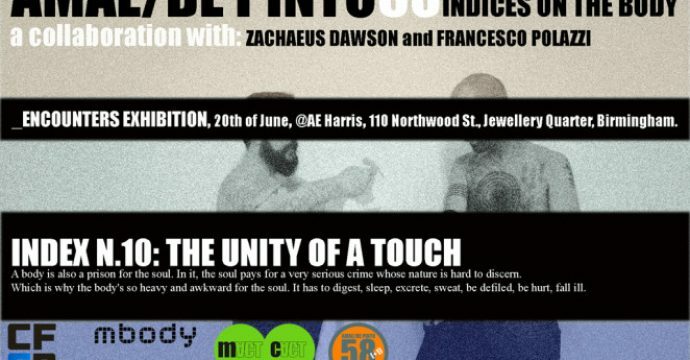 The themes preferred by the collective Amae and by De Pinto such as transience, transfer, otherness, virtuality, Queer Theory will be the very soul of the project, which is inspired by the 58 indices by Nancy, it will take charge of a method of creative presentation leading into a series of 58 (plus one) performances. The performances will focus on the idea of body from the physical, philosophical, biological, psychological, emotional, social, educational, economical and cultural point of view. 1. to stimulate discussion around the idea of the contemporary body itself in pursuit of a new awareness of the agents engaged with the project. 2. to communicate the cultural change required to broaden the understanding of the word “body”. 3. the various agents to bravely explore their own selves, in order to be able to engage with the discourse about the contemporary social human being. 4. to put together an enormous quantity of data, collected and synthesised into a text (corpus), which must give due consideration to all facets from which the contemporary human being is built. The long series of performances will cause the active visitor to be themselves author of those thoughts, of those actions and integrate them all. During 58 (+1) INDICES ON THE BODY the body Amae/De Pinto will put the public into a condition of active interaction with the performers through the use of technologies and softwares that were originally created for commercial and/or scientific purposes and now exploited for a brand new artistic practice. Among them we remind: QR codes, as viral diffuser of messages, texts, animations and videos. The use of video and audio-interactive installations, as well as softwares such as Processing, G-Force, Aeon and Whitecap of Soundspectrum and ASCII Projektor, or management softwares for the augmented reality, like FLARToolkit.